Nasa prepares to launch a spacecraft to Mars, where it will search for signs of past or present life. Nasa is to launch a spacecraft on a nine-month journey to Mars, where it will dig below the surface for clues to the existence of past or present life. The Phoenix probe is scheduled to lift off on Saturday from Cape Canaveral, Florida, atop a Delta II rocket. It will have one opportunity to launch at 0526 EDT (1026 BST) followed by a second chance at 0602 EDT (1102 BST). Phoenix was to launch on Friday, but severe weather conditions prevented fuelling of the rocket's second stage. This left little contingency time in the schedule, forcing Nasa officials to move the launch from Friday to Saturday. If everything goes to plan, Phoenix should arrive at Mars in late May 2008. The US space agency wants to land the probe on relatively flat terrain at a Martian latitude equivalent to northern Alaska on Earth. On these northern plains, water ice is thought to lie just a few tens of centimetres below the surface, within reach of the lander's 2.4m (7.5ft) robotic arm. Scientists estimate the ice content of the upper metre of soil in this region could be as high as 50-70%. The mission will aim to shed light not only on the history of this water ice but also on whether the region could support microbial life. Crucial to this question will be tests for complex, carbon-based chemicals (organics) in the soil and signs the ice periodically melts. "The real question we're trying to answer is: 'has that ice melted', because liquid water in contact with soil may provide us with a habitable environment," said Peter Smith, the mission's principal investigator and a professor at the University of Arizona. He added: "For microbes, the word 'habitable' means you have liquid water, complex organic molecules of the type our bodies are made of - proteins, amino acids and so on - and it also means you have energy sources." Mission scientist William Boynton, also from the University of Arizona, said: "One of the interesting questions is why organic molecules weren't found on the surface of Mars by Viking [Nasa Mars mission from the 1970s]. "The answer is we think there is a mechanism which can destroy organic molecules on Mars. This mechanism might not be operating in the polar regions because water and ice can decompose the oxidants that destroy the organics." But proof of these in the Martian soil would not show that life exists, or once existed, Professor Boynton pointed out - only that it could exist. On the surface, the solar-powered craft will deploy its robotic arm to dig down vertically through the soil towards the icy crust. The arm will deliver samples of soil to the lander's deck for analysis by a powerful suite of instruments. These will check the samples for water and organics, characterise the physical properties of the soil, determine abundances of different minerals, and subject dust grains to microscopic examination. Mission scientist Dr Tom Pike, from Imperial College London, told BBC News: "We will have the first imaging instrument to zoom in on individual dust grains. Dust is important because it cloaks the planet and has engineering and atmospheric consequences. "The two US rovers [currently on Mars] are suffering at the moment because a global dust storm is cutting off the power from their solar panels." The spacecraft will also conduct a study of the Martian polar atmosphere and weather. Dr Pike added: "Life is always the headline grabber, but we've got to get good science out even if we don't find life - because in all probability, we won't. So we can't make that the focus of the mission." Unlike Nasa's roving robots Spirit and Opportunity, Phoenix will be stationary on Mars. It is due to carry out scientific operations for three months on the Martian surface. The $420m (£206m) mission is so-named because it carries with it the legacies of two earlier failed attempts to explore Mars. The lander was built for the Mars Surveyor mission originally planned for 2001, but mothballed by Nasa in 2000. And many science instruments for Phoenix were built or designed for Mars Polar Lander which was lost as it entered the Martian atmosphere in 1999. 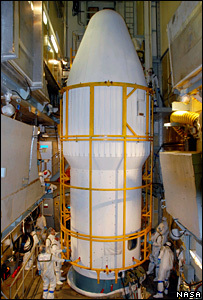 The spacecraft's launch window from Cape Canaveral Air Force Station extends until 24 August.